Apparently the KL Open has been postponed until August 2011, but this is not fully confirmed as yet. More details as they become available. Suvich Tachaplalert got an amazing 7/7 in Malaysian Open rapid chess event in under-14 category last Sunday. He is the first ever Thai to win any kind of open international chess event outside Thailand. There were 34 players in his category. 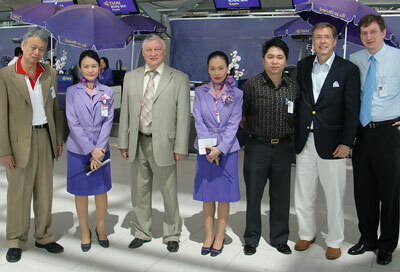 Seen here with the Thai Airways Cabaret are Khun Smarn (TCA), GM Karpov, Khun Sahapol (TCA), Richard Conn Jr., and BCC President Kai Tuorila. Seven-time World Chess Champion GM Anatoly Karpov and Richard A. Conn Jr., FIDE candidates for President and Deputy, dropped by briefly to Bangkok to meet TCA and BCC officials. Bangkok Chess Club wishes good luck for their election campaign, and is looking forward for “chessful” cooperation in the future. More details on Karpov’s campaign can be found at www.karpov2010.org. Atippat was the clear winner of TCA Prajuab Cup, 6-rounds Swiss, Fide-rated tournament, which was organized in the beautiful Bangkok Boulevard Club House. Atippat lost surprisingly in the first round, but won all the rest 5 games. He was followed by FM Boonsueb with 4.5 and Teerapong with 4 points. The 4th place was shared by Aung, Henry and Piyapon. Full results at thaibg.com. Thank you K.Ekasith for hosting this tournament! DGT 2010, the official chess clock of the world chess federation FIDE, is available now in Thailand from our partner, PK Snowbird. 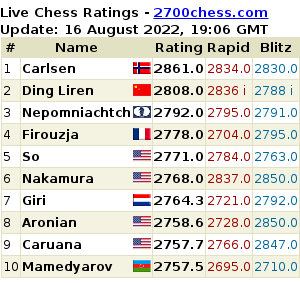 The DGT 2010 was introduced in 2007 and received the status of “Official FIDE chess clock” in June 2008 after tests by four top-level arbiters concluded that the clock is in full accordance with all FIDE rules and regulations. Larger display, with more information for player and arbiter e.g. visible timing system, black-white indicator and a big “flag”. Easier to program in manual set with the new “-1” one-step-back button. See the video instruction. Contact PK Snowbird for more details.